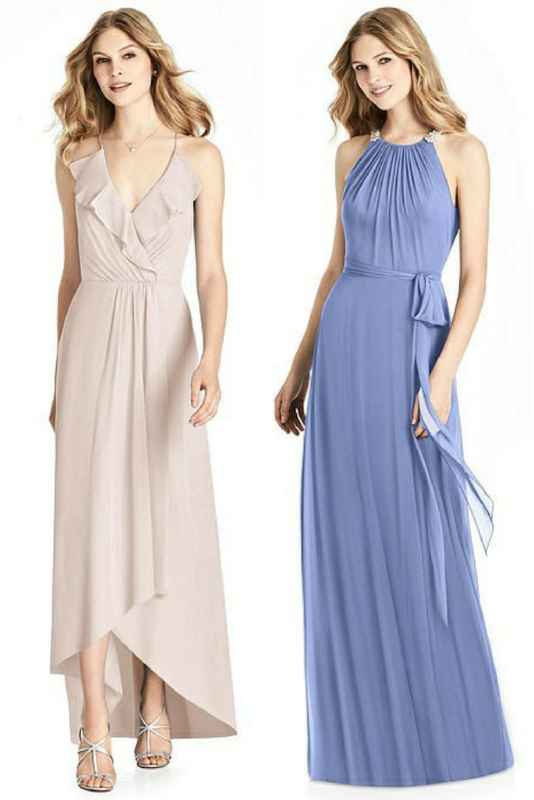 One of the ways we like to help brides-to-be is by suggesting different color combos for their bridesmaid dresses. 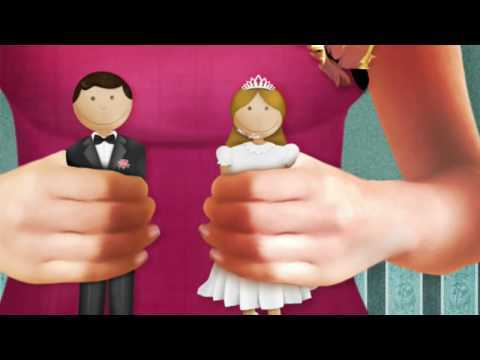 In fact, ways of working color through all the aspects of a wedding party. 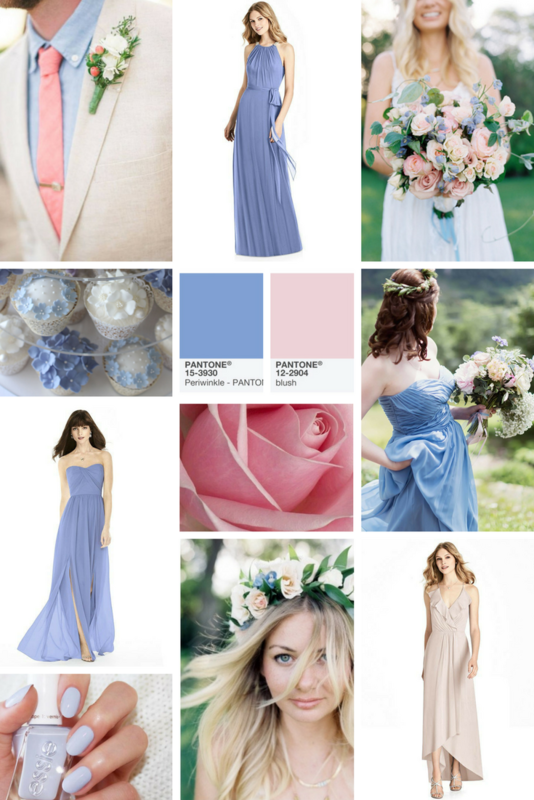 And today, because spring is most definitely on its way (and about time too) we're going to feature a periwinkle blue and pink color theme. It's a really romantic color mix. Delicate, classic, dreamy and really, really lovely. Mix the two together and your maids can choose the shade that suits them best. Talk to your florist about flower options. We're thinking pink peonies, blush pink roses, forget-me-nots, cornflowers, delphiniums. Don't feel you have to have exact color matches, it looks much better to mix it up a bit. Same applies with your bridesmaid frocks. Windsor blue, periwinkle and blush are some color options from Dessy, but all these shades can be mixed and matched together and will blend beautifully. (Think a sort of ombre effect). If you'd like some help choosing your colors and working out which combo you like best, then check Dessy's Pantone color tools, which give you the right shades so you can communicate them to your florist, bridal designer, venue, cake decorator - and whoever needs to know. Tie your wedding bouquet (and maybe the bridesmaid bouquets) with red and pink ribbons, in a soft gauze. 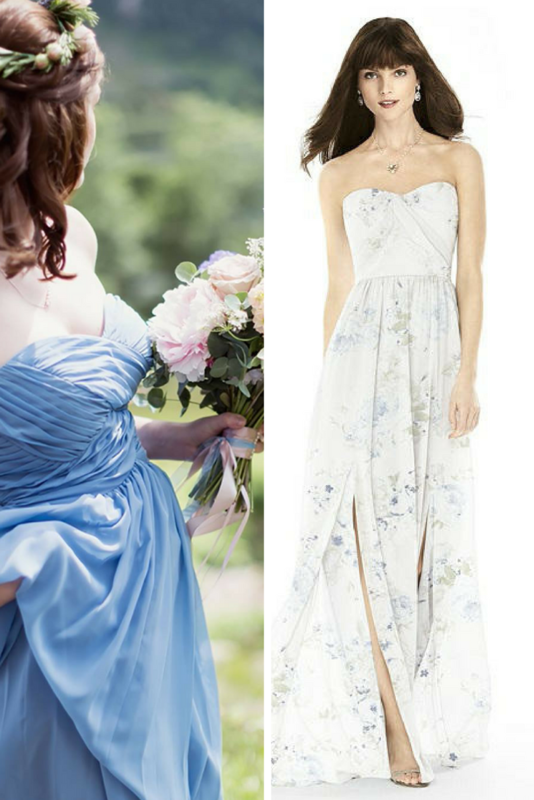 We love floaty chiffons and lighter fabrics with these colors, especially if you're having a rustic style wedding day and getting married in the afternoon. As the bride, you could give a nod to the theme with your bouquet of course - but also maybe with some delicate blush pink wedding shoes or blue, peeking out shyly from the hem of your wedding gown. Flower crowns are definitely having a moment right now, so consider them for your maids, or even yourself, if it's a boho sort of an event. They look super cute on flowergirls of course. As for your groom, take a look at the light, tan colored suits which would work so well with pale pinks and blues for bow ties, vests and maybe socks!